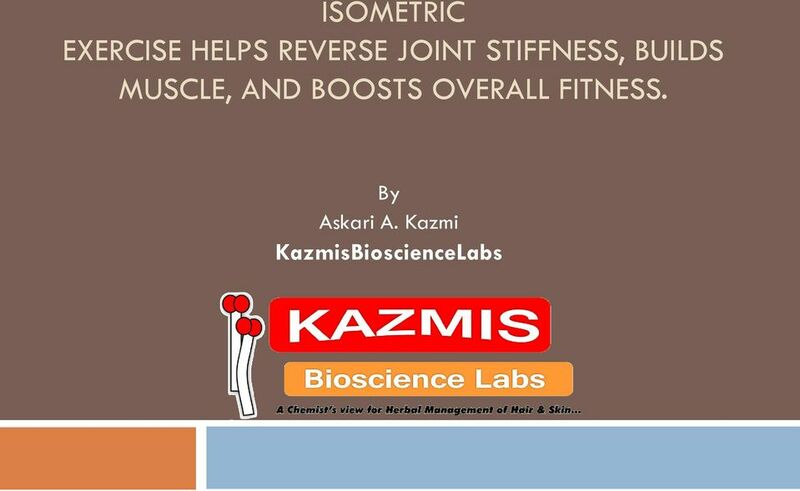 Download "ISOMETRIC EXERCISE HELPS REVERSE JOINT STIFFNESS, BUILDS MUSCLE, AND BOOSTS OVERALL FITNESS." 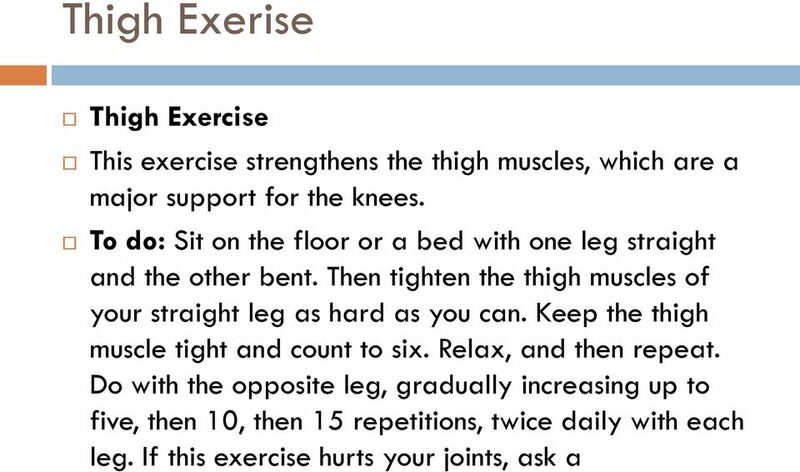 2 exercise helps reverse joint stiffness, builds muscle, and boosts overall fitness. 3 ISOMETRIC EXERCISE Try Isometrics When regular strength training is painful on the joints, isometrics exercise is another way to build muscle. Isometrics involve tensing the muscle without any visible movement. 4 The isometric chest press can be done anywhere and needs no equipment. 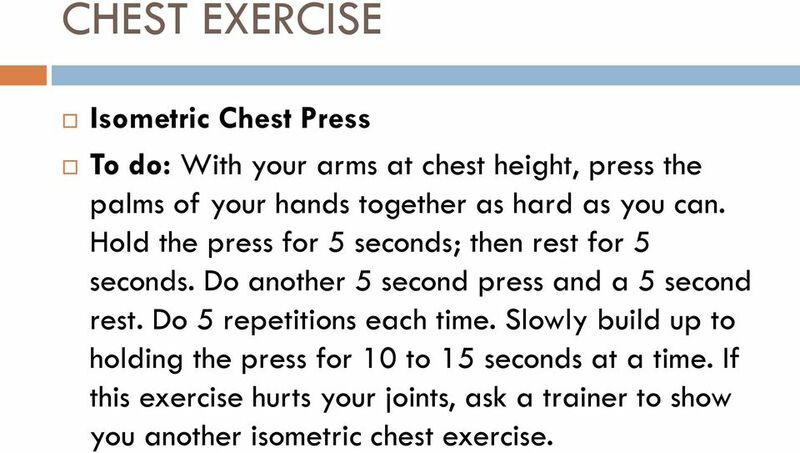 5 CHEST EXERCISE Isometric Chest Press To do: With your arms at chest height, press the palms of your hands together as hard as you can. 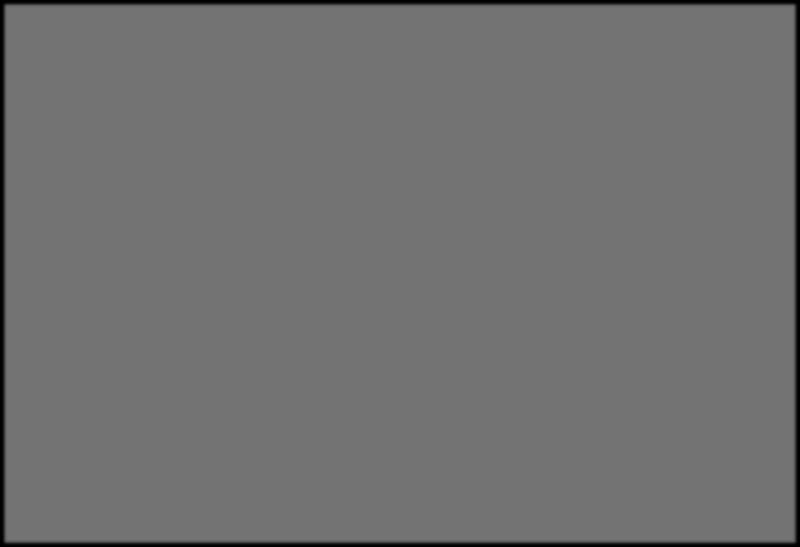 Hold the press for 5 seconds; then rest for 5 seconds. Do another 5 second press and a 5 second rest. Do 5 repetitions each time. Slowly build up to holding the press for 10 to 15 seconds at a time. 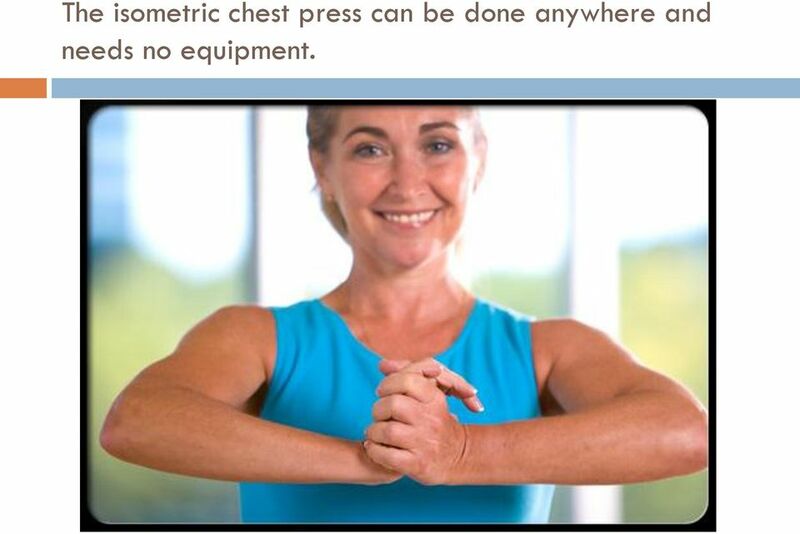 If this exercise hurts your joints, ask a trainer to show you another isometric chest exercise. 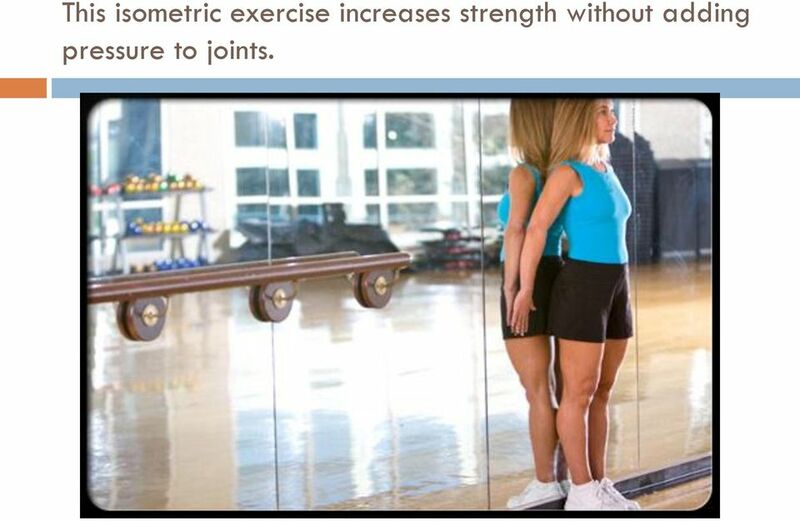 6 This isometric exercise increases strength without adding pressure to joints. 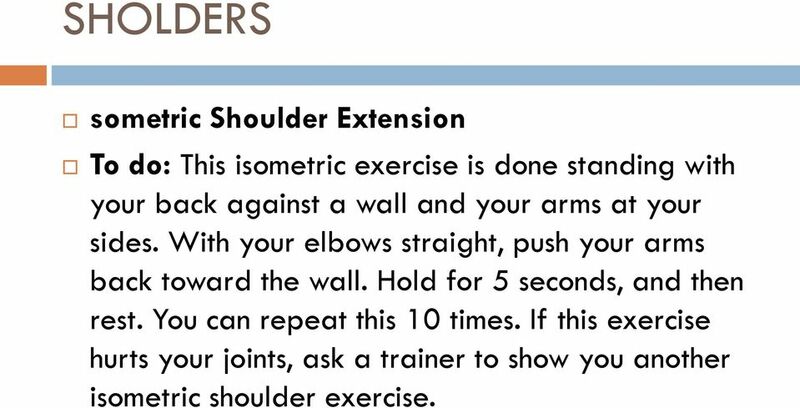 7 SHOLDERS sometric Shoulder Extension To do: This isometric exercise is done standing with your back against a wall and your arms at your sides. With your elbows straight, push your arms back toward the wall. Hold for 5 seconds, and then rest. You can repeat this 10 times. If this exercise hurts your joints, ask a trainer to show you another isometric shoulder exercise. 8 Strengthening the thigh muscles helps support the knees. 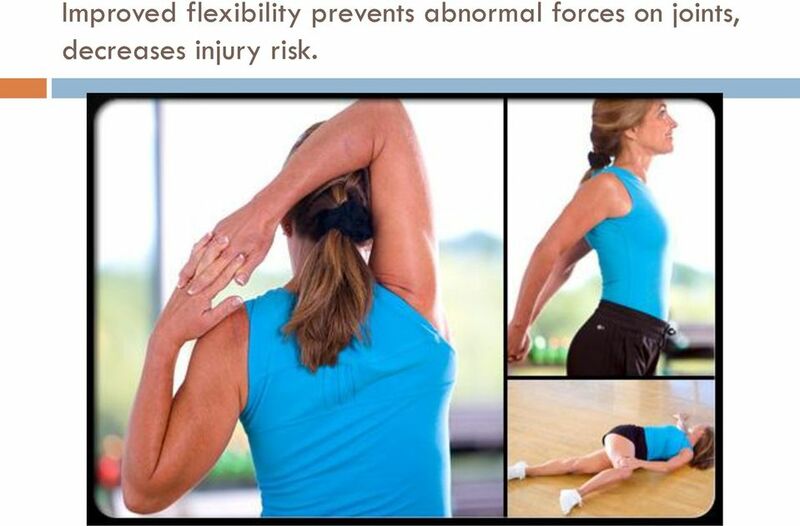 10 Improved flexibility prevents abnormal forces on joints, decreases injury risk. 11 Stretching Stretch to Increase Flexibility Regular stretching is important to increase flexibility and restore joint motion. To ease pain and stiffness, use moist heat or warm baths before and after stretching exercises. Also, warm up with light aerobic exercise such as walking for 10 minutes before stretching to decrease risk of injury. Hold stretches for 30 seconds without bouncing or jerking. Tip: Use a towel to bridge the distance between your hands if you cannot comfortably connect them. 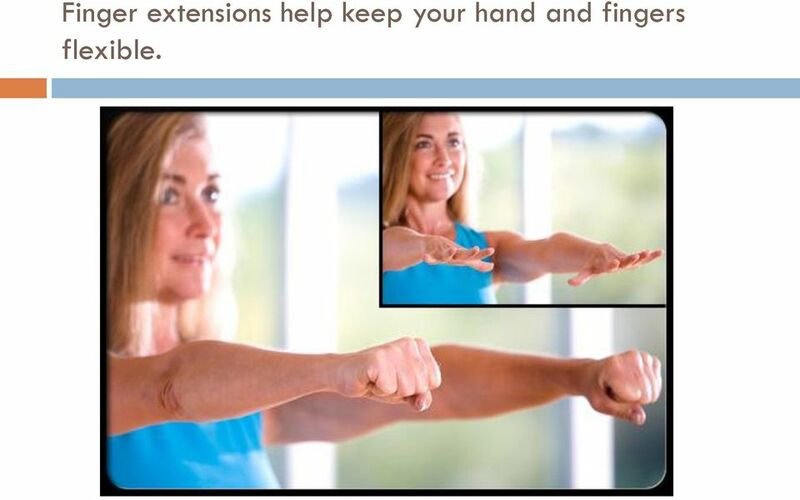 12 Finger extensions help keep your hand and fingers flexible. 13 Fingers Stretch Your Fingers To do: Close your fingers, making a fist. Then, open and extend the fingers as straight as possible. Repeat this exercise, gradually increasing up to 20, twice daily. To further increase strength, squeeze a foam or sponge ball about the size of a tennis ball. Release and extend the fingers. 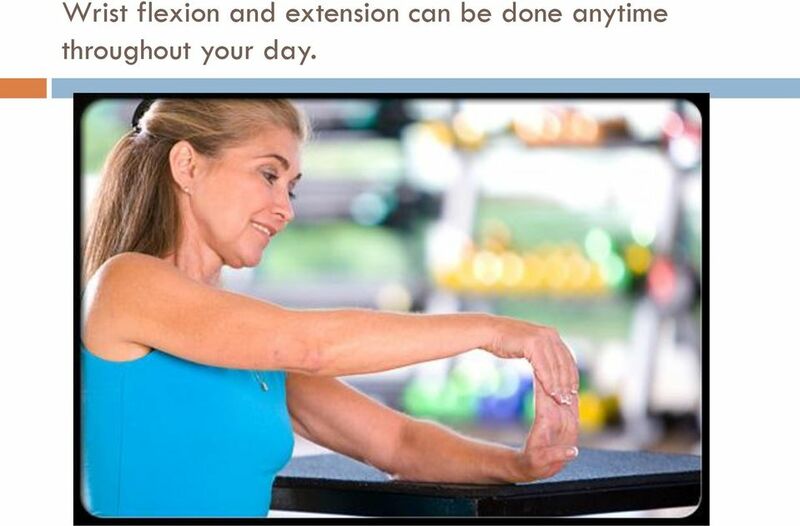 14 Wrist flexion and extension can be done anytime throughout your day. 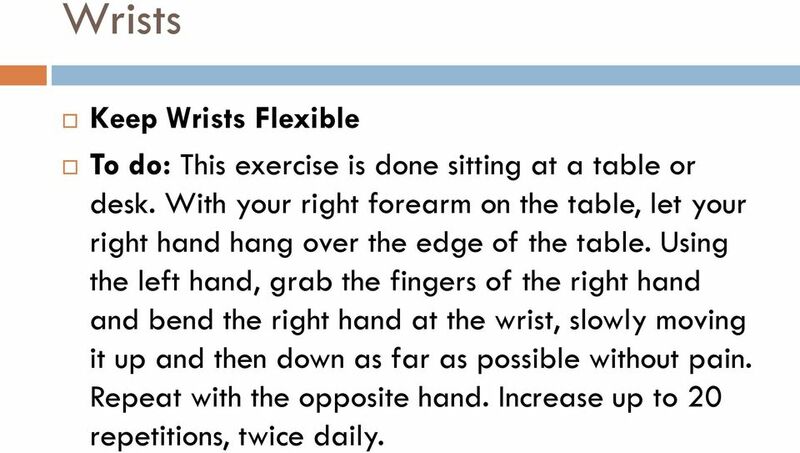 15 Wrists Keep Wrists Flexible To do: This exercise is done sitting at a table or desk. With your right forearm on the table, let your right hand hang over the edge of the table. Using the left hand, grab the fingers of the right hand and bend the right hand at the wrist, slowly moving it up and then down as far as possible without pain. Repeat with the opposite hand. Increase up to 20 repetitions, twice daily. 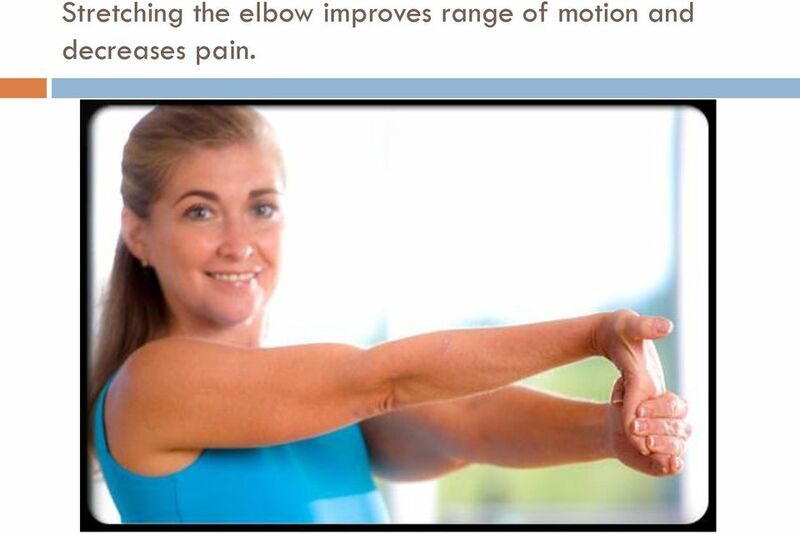 16 Stretching the elbow improves range of motion and decreases pain. 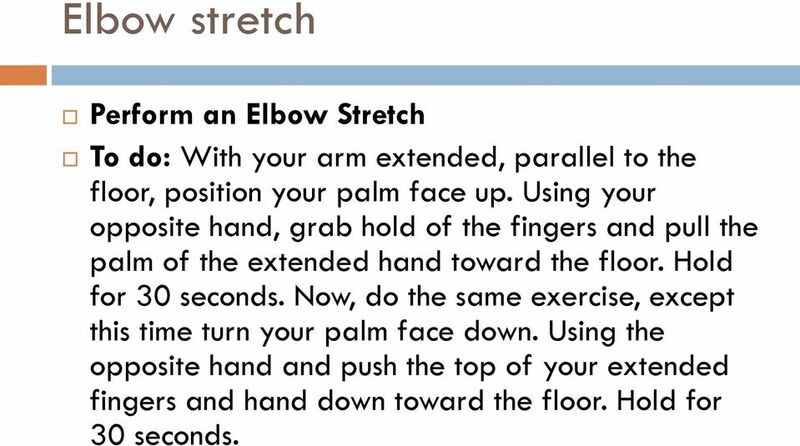 17 Elbow stretch Perform an Elbow Stretch To do: With your arm extended, parallel to the floor, position your palm face up. Using your opposite hand, grab hold of the fingers and pull the palm of the extended hand toward the floor. Hold for 30 seconds. Now, do the same exercise, except this time turn your palm face down. Using the opposite hand and push the top of your extended fingers and hand down toward the floor. Hold for 30 seconds. 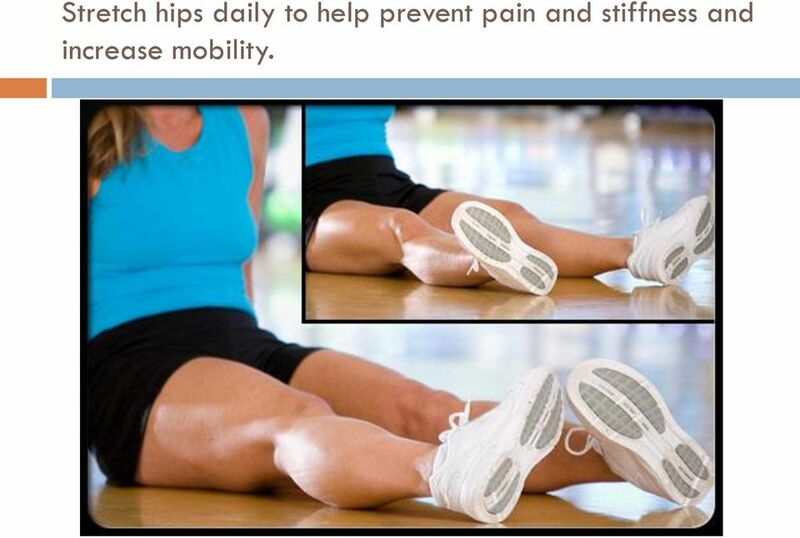 18 Stretch hips daily to help prevent pain and stiffness and increase mobility. 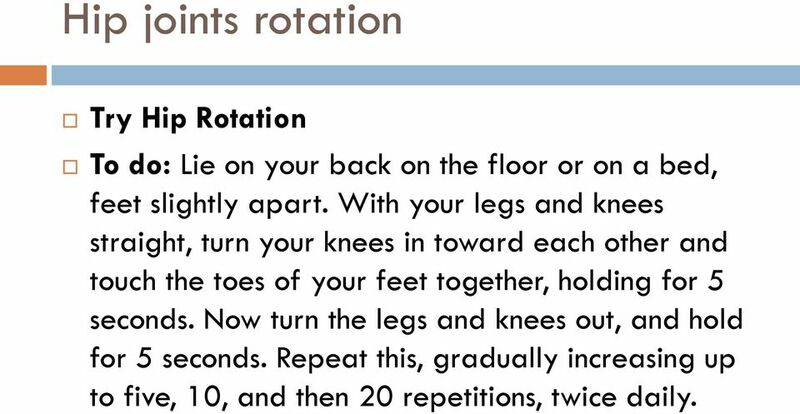 19 Hip joints rotation Try Hip Rotation To do: Lie on your back on the floor or on a bed, feet slightly apart. With your legs and knees straight, turn your knees in toward each other and touch the toes of your feet together, holding for 5 seconds. Now turn the legs and knees out, and hold for 5 seconds. Repeat this, gradually increasing up to five, 10, and then 20 repetitions, twice daily. 20 Perform the Achilles stretch to keep feet flexible. 21 Feet Get Flexible Feet To do: Facing the wall, place palms flat on the wall, one foot forward, and one foot back. Leaving your heels on the floor, lean forward. As you do so, feel the pull in your calf and the Achilles tendon at the back of the ankle. Hold for 30 seconds. Do three repetitions. Then reverse the position of your legs and repeat. 22 Books and videos on tai chi are available online and at local bookstores. 23 Ta chi Tai Chi Increases Flexibility The ancient discipline of tai chi can help those with RA increase range of motion, boost flexibility, and tone muscles to provide better balance. The focus of tai chi is on breathing and creating an inner stillness, allowing participants to relax. 24 Get more rest when your RA is active and more exercise when it is not active. 25 Balance between exc & Rest Balance Rest with Exercise Fatigue is common with RA, making it difficult to feel energetic, so balance rest with exercise. During a flare, short periods of rest are important to reduce active joint inflammation and pain and to fight fatigue. This doesn't mean bed rest, unless your doctor recommends it. Too much inactivity weakens muscles and can increase joint pain. Active Range of Motion: A. Flexion: Gently try to bend your wrist forward. Hold for 5 seconds. Repeat for 3 sets of 10.